Titanfall 2 was put in a rough spot, launching squarely between Battlefield 1 and Call of Duty: Infinite Warfare. All three are AAA first-person shooters which rely heavily on their multiplayer communities, but as the newest kid on the block, it was easy to overlook the game about robots and jetpack-wearing pilots. 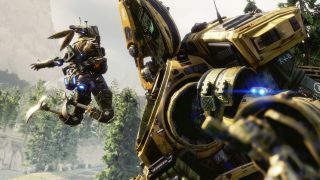 Well, no excuses this time: developer Respawn is inviting everyone to try Titanfall 2 multiplayer for free this weekend. EA Access and Origin Access members can download and play Titanfall 2 multiplayer starting Wednesday, November 30, while the rest of us have to wait until Friday, December 2. There will be no separate servers or closed-off features for those who don't already own the game, and progress made during the free weekend will carry over should you decide to pick up a copy. The event also coincides with the release of Titanfall 2's first post-launch DLC, Angel City's Most Wanted. Along with a remastered version of the Angel City map from the original Titanfall, this free update adds a customization shop and new weapons for players to enjoy. So if there were ever a time to strap yourself into the cockpit of a heavily armed biped mech, I'd say this weekend is that time.